Place all ingredients in bowl and mix gently. Refrigerate and serve with tortilla or fresh vegetables. I’ve had this recipe in my inbox for awhile, waiting for the perfect moment to give it a whirl. That day presented itself yesterday. While cooking dinner for my family last night I wrote down the simple ingredients and mixed my own little evening refresher – a Watermelon and Cucumber cocktail. You can find the original recipe on TheKitchen.com. If you want to make this a non-alcoholic drink, just switch out the alcohol for some club soda or even 7-Up. But, below was my variation. Combine all ingredients in a cocktail shaker with ice. Shake and strain into a cocktail glass. 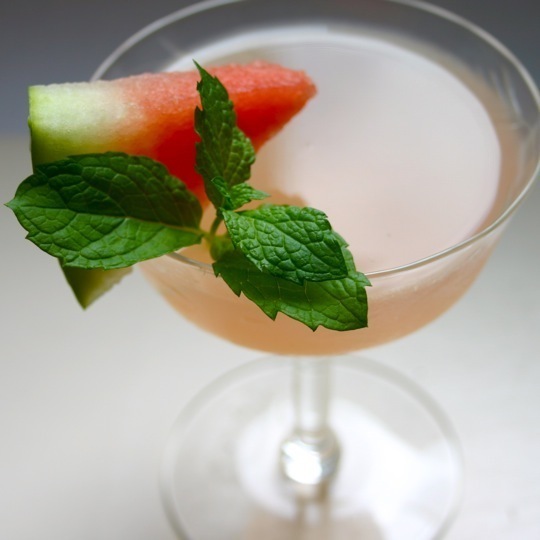 Garnish with a watermelon and/or cucumber slice and/or a sprig of mint. Whir all ingredients together in a blender. Strain through a fine-mesh strainer. Discard pulp. Another great way to enjoy in the freshness that the farmers market offers! So, get out today and shop local. Ah….what to do with all those cucumbers? Before we think about ways to prepare cucumbers (or cukes), let me explain all about this plentiful product. Growing them: Cukes like warm weather and moist soil, but when it gets too hot and dry, cucumbers grow bitter. Expextations: Refreshing juiciness, fresh flavor. Avoid yellowed cucumbers, indicating they are overgrown; instead choose cukes on the small side with firm, shiny skin. Nutritional Lowdown: Traces of vitamins E, C, A, potassium, manganese, folate, magnesium. Most nutrients are found in its skin, as is fiber. Storing: In plastic in the fridge, cukes keep about a week; when they get old they get bitter and loose crispness. Once cut into they don’t last long, so use up within a couple days. 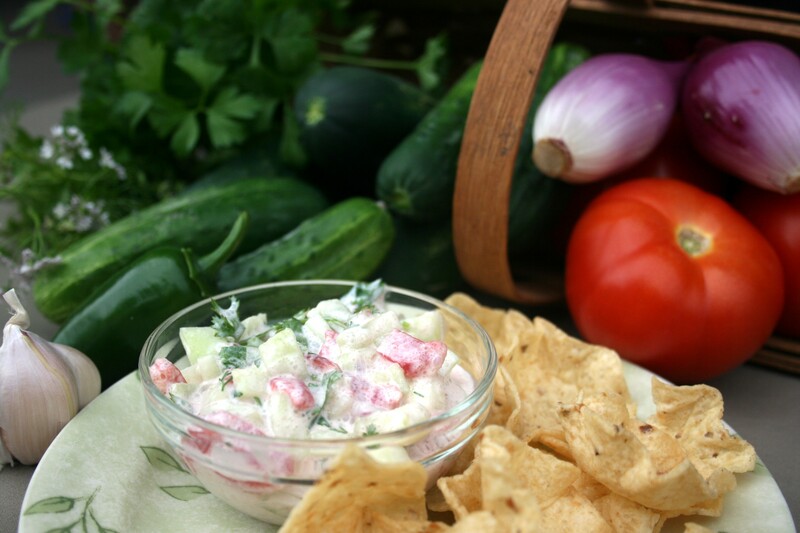 Why are local cukes better for your family? Local cucumbers aren’t waxed like the ones at the supermarket, so you don’t have to peel them and loose all the vitamins. You can also pick just the size and variety you want. Wash gently, and dry. Peel only if skin is old, thick, or especially bitter. Cut into canoes, sticks, slices, chunks, or grate to suit. “Japanese” cucumbers are long and skinny. Their seeds are very small, and they are often very tender and high in water, extra crispy. “European” cucumbers: look like very big Japanese cukes, and likewise have less developed seeds. Good for all uses. “American slicing” cukes are the “regular” kind. When the cukes are on the big side, you can scoop out the seeds if they are intrusive. Believe it or not, people can and do cook cucumbers, by sautéing seeded chunks of cucumber in butter over low heat. Why not try it? Add dill and scallion before serving. A classic Japanese salad: Slice 4 Japanese cukes as thinly as possible (a slicer is ideal). Sprinkle them with salt, mix well, and let sit a few minutes. Then squeeze out excess juice. Dress with a blend of ½ c rice vinegar, ½ cup water or dashi stock, 2 T soy sauce, 1 T sugar. 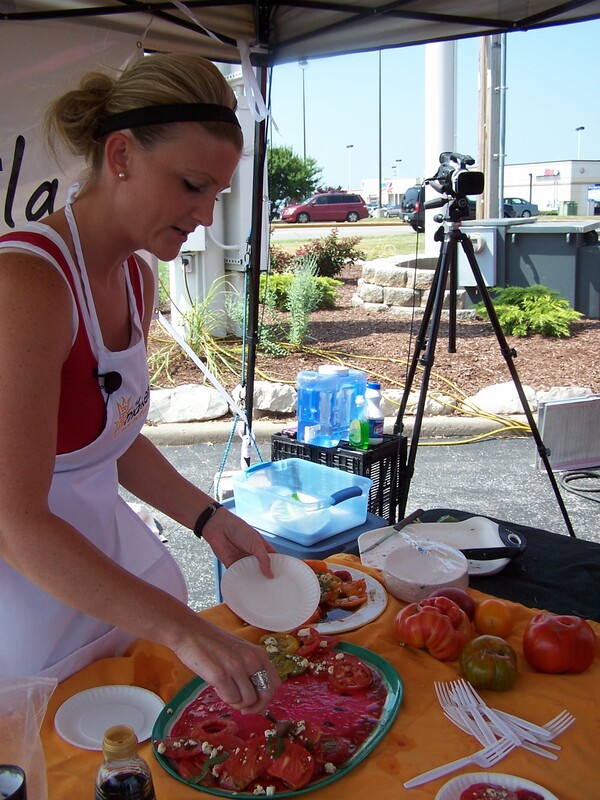 The Market Lady, Lane McConnell, will visit the Christian County Farmers Market in Ozark, Mo., Tuesday, July 19. The Market Lady and video crew will begin at 5:00 p.m., with one cooking demonstration incorporating products from the market and will be interviewing producers and consumers for various other segments. Below is one recipe that The Market Lady will be preparing at the market. Be sure and come out to the Christian County Farmers Market on July 19 to meet the Market Lady and video producer Kelsie Young in the parking lot of the Community Center. Soak 1/2 thinly sliced red onion in cold water. Pat dry 4 cups diced watermelon and 1 seeded and sliced cucumber; toss with a handful of thinly sliced mint. Drain the onion, squeeze dry and add to the salad along with some chopped cashews. Add 1/4 cup olive oil and the juice of 1/2 lemon; season with salt and toss. Top with crumbled goat cheese or feta. 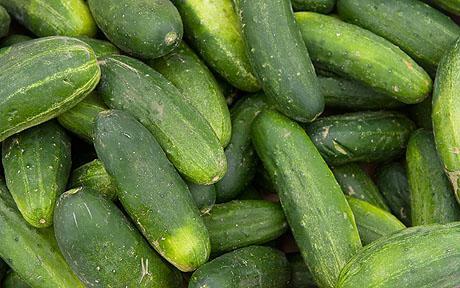 The season for cucumbers in Missouri runs mid-June through September and market vendors can offer you many storage tips to preserve your market goodness. 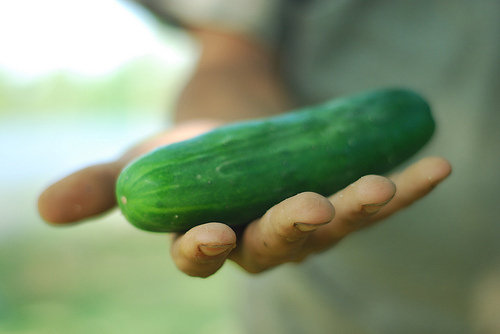 GROWING: Cukes like warm weather and moist soil, but when it gets too hot and dry, cucumbers grow bitter. WHAT TO EXPECT: Refreshing juiciness, fresh flavor. Avoid yellowed cucumbers, indicating they are overgrown; instead choose cukes on the small side with firm, shiny skin. VITAMINS AND MINERALS: Traces of vitamins E, C, A, potassium, manganese, folate, magnesium. Most nutrients are found in its skin, as is fiber. STORAGE: In plastic in the fridge, cukes keep about a week; when they get old they get bitter and loose crispness. Once cut into they don’t last long, so use up within a couple days. WHY BUY IT LOCALLY? Local cucumbers aren’t waxed like the ones at the supermarket, so you don’t have to peel them and loose all the vitamins. You can also pick just the size and variety you want. Japanese cucumbers are long and skinny. Their seeds are very small, and they are often very tender and high in water, extra crispy. European cucumbers: look like very big Japanese cukes, and likewise have less developed seeds. Good for all uses. American slicing cukes are the “regular” kind. When the cukes are on the big side, you can scoop out the seeds if they are intrusive. I’ve got some recipes coming up…so stay tuned! The Market Lady, Lane McConnell, will visit the Lamar Farmers Market in Lamar, Mo., on Wednesday, June 8. The Market Lady and video crew will begin at 3:30 p.m., with one cooking demonstration incorporating products from the market and will be interviewing producers and consumers for various other segments. One recipe The Market Lady will be preparing at the market is a Farm Salad with Feta Cheese. Below find the recipe for printing in your publication. Be sure and come out the Lamar Farmers Market on June 8 to meet the Market Lady. Combine all ingredients and chill. Serve cold.